This is an excerpt from the translated speech that was given on 23rd December at the International Avian Summit Conference by its supreme leader, General Hen Peck (no relation of Gregory Peck of course) in the national capital. It is here that we meet to make a resolution for the future. Our future. A Better future. And for performing this Her-mule-ean duty I ask of you to come forward and bear the burden of our miserable past. Only you can leave a proud precedent for posterity. 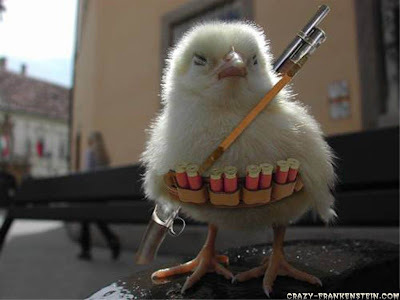 Join the Fowl Brigade. (Now howling like an autumn gale) Infect yourselves with strains of the virulent Avian flu. Look as eternally sumptuous as you and your forefathers have while gracing human buffets, caressing their palates, inviting their appetites. And then (with a cruel cunning showing ominously in his beady eyes...he whispers like the Dimer-Devil (Diabolique-de-Chicken) himself) strike with all you’ve got! The prices will fall. Many of us will be mercilessly culled. But, we must be unwavering in our pursuit, unfailing in our mission. The deceased should pass the baton (the flu i.e) to the next and the plague would proliferate in no time. Remember (thunderously pounds the desk and the podium), it is upon your ability to protect the virus from extinction on which our success hinges. Make the air resonate with billions of human sneezes. Our brothers from the Hawk-and-Vulture Council of Elders have offered volunteers for furthering our just cause. Negotiations are on to rope-in influential members of the Pork-Parliament. Get killed, you will in the process. Only ensure that you are handled with no protective clothing on the humans, and persevere, if possible, to jump out of the cauldron before it reaches that deadly 60-degree Celsius. Soon, the pandemic will be ours. And panic our cry. More so, in the West Bengal Government. (End of speech to sustained waves of cheers and applause).